Outstanding Crochet: Fabulous Crochet Stone Maxi skirt. Done! Fabulous Crochet Stone Maxi skirt. Done! Absolutely love my skirt! I've got so many compliments! What interesting is sometimes I start new project with spirit, thinking it's going to be gorgeous, and at the end I don't like it at all. This skirt I started with no spirit whatsoever, and I am very sutisfied with the result, I love it. Thanks to my friend Natalie who took these lovely pictures in her backyard! Великолепная юбка! Поздравляю с завершением работы. Очень красивая юбка получилась! Весь образ прекрасен :). I would pay a lot of money for you to make this skirt in a size small/xs. Would you ever consider it? it's $98 and they have your size. Did it help? I could make it probably, but it's going to cost more. 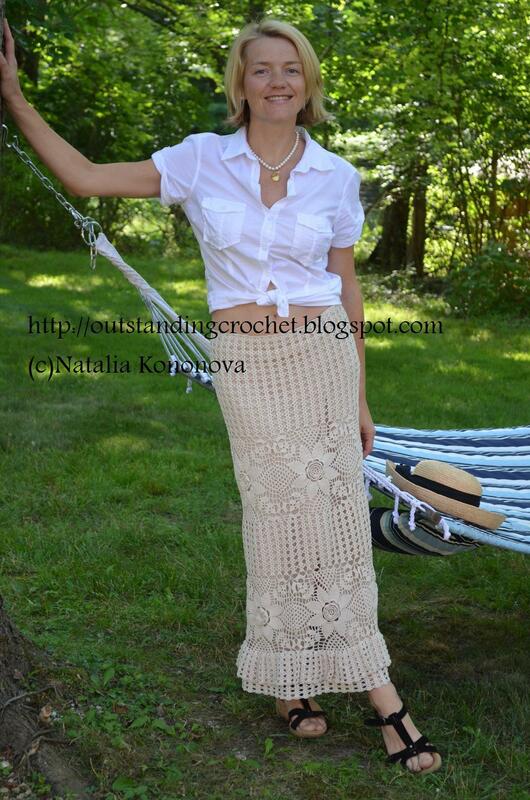 Where may I obtain this wonderful crochet skirt pattern? Can you please tell me which yarn (name and size) should i use for making the skirt? Beautiful thank you,I will try to make it,I can use any granny square that I like right? Why not. There is a pattern though: http://www.irishcrochetlab.com/#!product/prd3/1877795965/boho-skirt.-crochet-pattern.